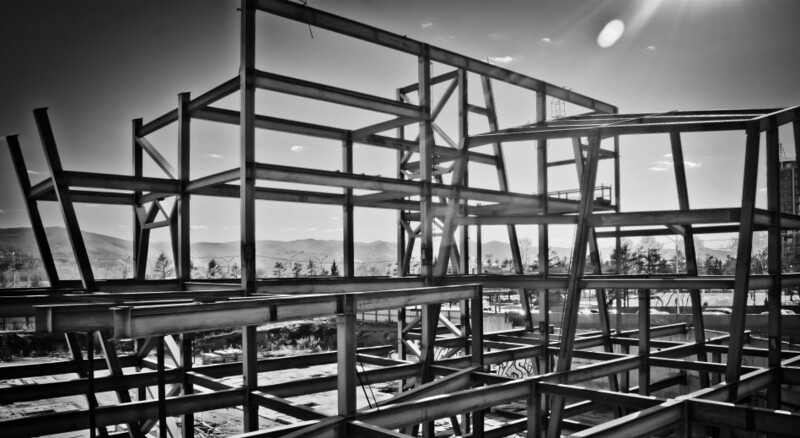 "Construction" by Alex Kislow, used under CC BY 2.0 / Desaturated from original, with colour filter. What are the costs and benefits of regulation? Most countries treat smaller firms more generously when it comes to business regulation, exempting them from some of the burdens on larger firms. This research uses this institutional feature to show how the overall costs of regulation can be calculated from observing companies’ response to this “tax on firm size”. This research uses data from France where a large number of labor market regulations bind when a firm has 50 or more employees. These regulations are intended to help workers, but they also discourage firms near the 50 employee threshold from growing larger and producing more output. They also increase the cost burden on firms who choose to remain large. We calculate the regulations depress overall economic output by over 3%. Thus, the costs are relatively high. We also find that workers do not place much value on the extra regulations imposed on bigger firms. All over the world, economic growth has been disappointing in the last decade. There are many reasons for the growth slowdown, for example falling productivity and lower population growth. But many people argue that “red tape” – especially labor regulations that discourage firms from growing and reduce productivity – are an important contributing factor. Others dispute this, arguing that the regulatory costs are small relative to the benefits to workers from labor market regulation. One feature of many regulations is that they only kick in after firms reach a certain size. Under the US Affordable Care Act (“Obamacare”), for example, firms with 50 or less employees face lower penalties for failing to provide employee health insurance than larger firms. In France, which is the focus of our study, firms face a virtual Tsunami of labor rules when they reach the 50 employee threshold. Enterprises must form a “works council”, offer union representation, have a profit sharing scheme, pay more into a training budget and negotiate with the Labor Ministry if they want to downsize. There are some other regulatory size thresholds, but this is by far and away the most important one for employment law. The fact that larger firms have to pay a higher regulatory “tax” may be a reason why some companies just below the threshold of 50 employees do not want to grow. The fact that larger firms have to pay a higher regulatory “tax” may be a reason why some companies just below the threshold of 50 employees do not want to grow. Indeed, countries like Italy and Portugal which have a large number of such regulations are well known to have a much greater fraction of small firms than more lightly regulated economies such as the US and UK. The size-dependent nature of regulations provides a way of figuring out how costly they are. The first step is to assess how the regulatory threshold affects the size distribution of firms. Figure 1 shows the number of French firms around the regulatory threshold of 50 employees. It is clear that there is a sudden drop in the number of firms at exactly 50 employees. Notes: This is the population of manufacturing firms in France (FICUS.) with between 31 and 69 employees in in manufacturing. This plots the number of firms in each exact size category (i.e. raw data, no binning) for the year 2000. There is a clear drop when regulations begin for firms with 50 or more employees. 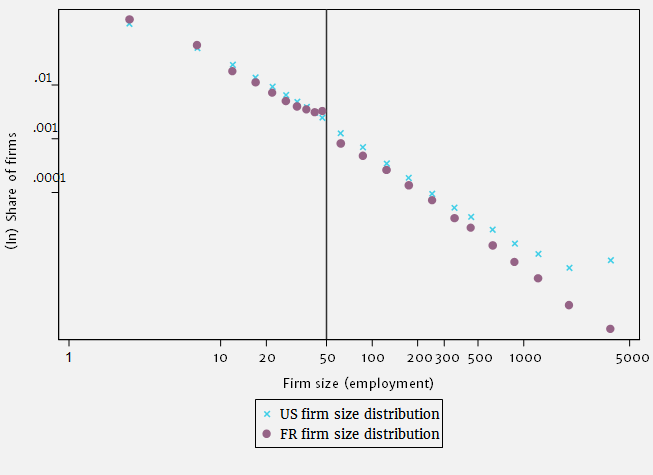 Figure 2 looks at the size distribution of all French firms compared to all US firms. As is well known, the fraction of firms of each size band declines as firms grow larger in both countries. 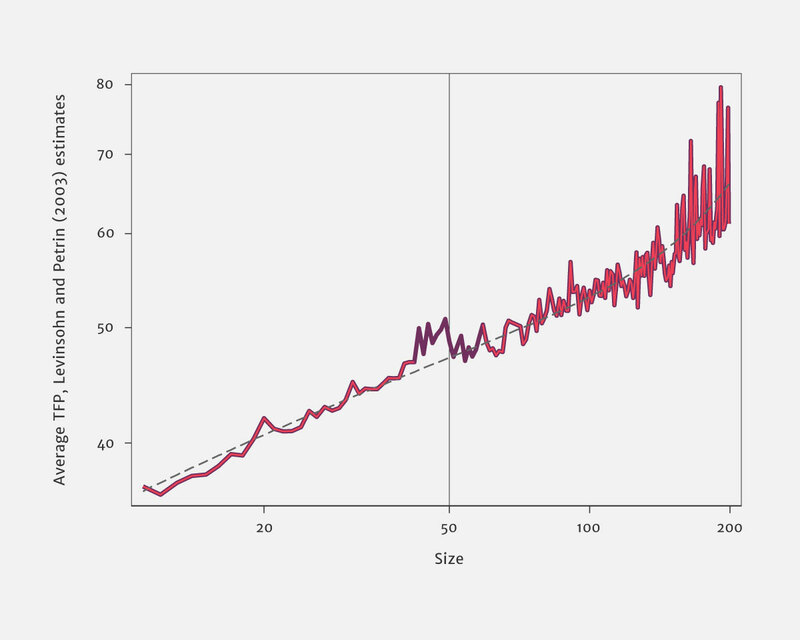 In fact the firm size distribution can be described as a “power law” which means when plotted on a log scale (as in Figure 2) it is essentially a straight line. Such power laws are seen in many parts of the natural and human world (e.g. the distribution of city size). Notes: This is the distribution of firms (not plants). FICUS 2003 for France and Census, LBD 2003 for the US. Population databases of all firms. Another remarkable feature of Figure 2 is the contrast between France and the US. The power law of firm size in France is broken at 50 employees, exactly where the main labor regulations begin to bite. There are more French firms just below the regulatory threshold and a smaller fraction of firms greater than 50 throughout the rest of the distribution. This makes economic sense – the regulation causes some firms to hover just below 50 employees, but by being an additional cost it makes all firms with more than 50 employees smaller than they would otherwise be. It would be hard to argue from this evidence that regulation has no effect, but how big are the costs? It would be hard to argue from this evidence that regulation has no effect, but how big are the costs? To put a number on this we can use some simple economic theory. Firms are usually big or small for a reason. The most efficient or innovative firms have higher productivity and will tend to be large – for example, they may have great technologies like Facebook or Google or an efficient manufacturing process like Toyota. They also tend to have better managers. A firm’s size relative to others therefore depends on its relative productivity, with the better entrepreneurs in bigger firms. But firm size can also be influenced by the cost of the regulation. We can think of the labor regulation as a tax on employees that begins at 50 employees, and then try to back out the magnitude of this tax by observing the way in which firms respond to the regulation. Firms who are really small are not directly affected by the regulation. But firms who would, for example, have chosen to have 50 employees without the regulation may instead choose to have 49 employees to avoid the tax. And the bigger the regulatory tax, the larger will be the “hump” of firms just below 50 employees and the “valley” in the firm size distribution just after 50 employees. Really productive firms will always choose to bite the bullet, be larger than 50 workers and simply absorb the cost of the regulation. Bill Gates would not keep Microsoft a micro firm just because of a labor law. But even these firms will tend to be a little smaller than they would have been without the regulation since their labor costs have gone up. The fact that more productive firms are not employing as many people as they would have without the regulatory tax means that overall economic output and productivity are lower. The fact that more productive firms are not employing as many people as they would have without the regulatory tax means that overall economic output and productivity are lower. The shape of Figure 2 is the key to calculating the cost of the French regulatory tax, which turns out to be equivalent to adding about 2.3% to labor costs. Essentially, the costs are calculated from the downward shift in the slope of the line at about 50 employees. This reflects the fact that the optimal level of employment for each firm below the threshold depends on the wage, whereas at or above the threshold it depends upon the wage plus the additional “tax” due to the regulation. Our theory also suggests that more productive firms should be clustered just below the 50 employee threshold. This is exactly what we see in the data in Figure 3 – there is an upward-sloping relationship between a measure of overall firm productivity (“total factor productivity”) and size which jumps up around the threshold. In other words, there are many more productive firms who would have grown to be larger (and created more aggregate output) were it not for the regulation giving them an incentive to stay below 50 employees. Figure 3: Total factor productivity (TFP) distribution around the regulatory threshold of 50 employees. 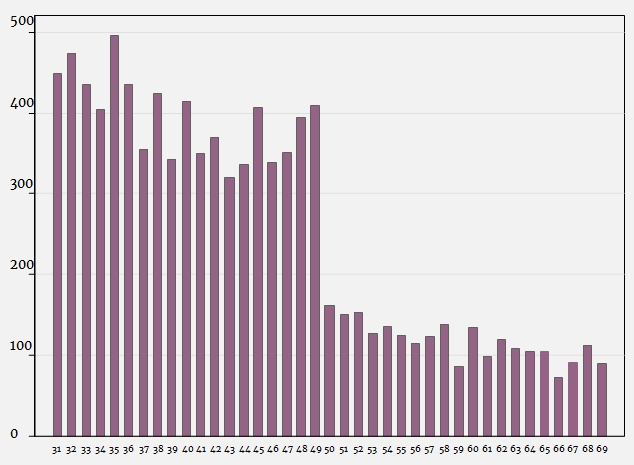 Notes: This figure plots the mean level of productivity (TFP) by firm employment size. The firms around the threshold are highlighted in bold. Manufacturing firms only. There is another, more subtle effect to take into account. Regulations are like a tax in another respect – the person who signs the checks is not necessarily the one who ends up paying the bills. A business tax levied on firms will end up being paid by in the form of lower dividends for shareholders, higher prices for consumers or lower wages for workers. Similarly, some of the incidence of the labor regulation will be felt in the form of lower economy-wide wages – lower demand for their services puts downward pressure on the price of labor. For firms, this lower wage is a benefit. It offsets the increase in labor costs so they do not need to reduce jobs by as much. In fact, this gives another reason for the large numbers of small firms in Southern Europe and in some emerging economies. Small enterprises in these countries are not only too small to be subjected to regulation, but they benefit from lower labor costs. Indeed, many mediocre managers may decide self-employment is a better option than lousy wages generating “too many” entrepreneurs! We find that this downward aggregate real wage adjustment channel is limited in France. This is because there is a high minimum wage and a large coverage of union agreements which prop up wages. So instead of lower aggregate wages falling, we find that unemployment rates increase. We calculate that this interaction between wage and job regulation means that output is reduced by around 3.4% – a non-trivial fraction of the economy. We estimate the degree to which real wages are held up using multiple methods. Our calculations suggest that in the long-run real wages only fall by about two-thirds of the amount they would fall in a more flexible economy. This means that the labor regulation increases unemployment as well as distorting the size distribution of firms. If wages were completely flexible and there was no unemployment effect of the regulation, GDP losses would only be about 1%, so much of the negative effect of the regulation is due to its effect of increasing unemployment. Since real wages are more flexible in the US than in France, this is a reason why the costs of size contingent regulations, such as the Obamacare provisions, are likely to be low. French firms will try to mitigate the costs of the regulation in many other ways. Our research shows that just below the threshold firms increase average hours (e.g. by employing fewer part-timers), the fraction of skilled workers (substituting quality for quantity), investment spending, and in some cases split themselves up into smaller entities. These distortions mitigate the cost of the regulation, but our calculations suggest that they do not cause the overall costs to fall materially. To the extent that workers themselves place a great value on the regulation, this should be reflected in their choice to work at firms just above 50 employees for lower wages than for those just below 50. They could trade off hourly wages for job security for example. However, we observe no sharp break in the wage-size relationship around the regulatory threshold. This is consistent with the idea that workers do not place much value on the extra regulations that bigger firms have (although this may also be due to the rigid nature of the French wage structure). Most regulations are introduced to tackle some problem where the market is perceived to have failed. But these benefits need to be weighed against the costs. Our findings do not mean that all regulations are bad. Most regulations are introduced to tackle some problem where the market is perceived to have failed. But these benefits need to be weighed against the costs, which are often hidden and hard to measure. Looking at what firms actually do in response to such rules (rather than what they or others say they do) is, we believe, a good way to assess this. Even simple information such as the size of firms can be creatively used to calculate the costs. The fact that regulations depend on size offers a way to “price out” the overall cost of the regulation. In the case of France these costs are not trivial. Having a lot of small firms is not always a beautiful thing. “Firm Size Distortions and the Productivity Distribution: Evidence from France” (Luis Garicano, Claire Lelarge and John Van Reenen, American Economic Review 106(11) 3439-79. Photo by Pablo via Flickr, used under CC by 2.0 / Desaturated from original with colour filter. Civil servants constitute a key element of state capacity, with the responsibility for raising government revenues, providing public services and implementing reforms. But what happens to their performance when they are appointed to office less on the basis of their talents than on their social connections to powerful patrons? 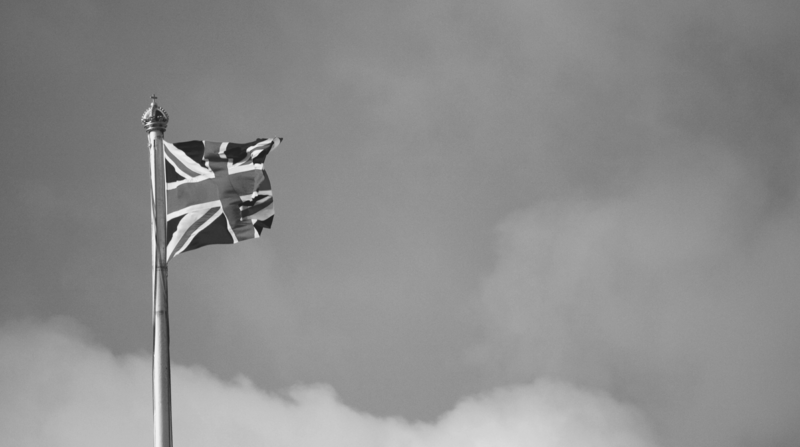 This research examines the costs of patronage through the lens of a historical bureaucracy that spanned the globe: Britain’s Colonial Office. The research combines newly digitized personnel and public finance data from the administration of the British Empire over the period 1854-1966 to show how patronage influenced the promotion and performance of colonial governors. 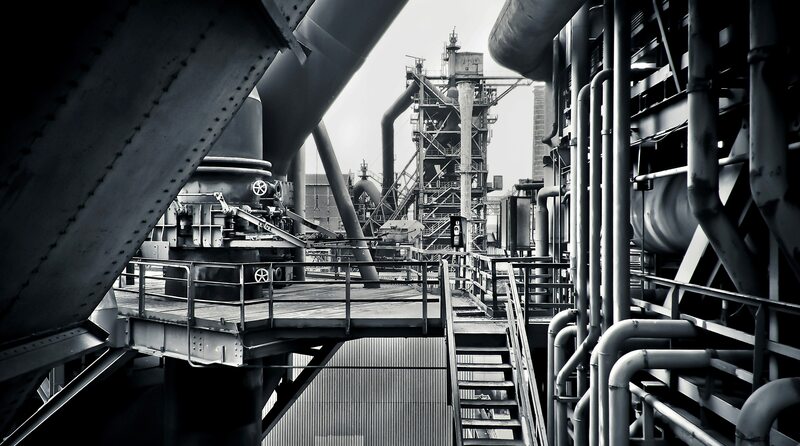 "Industrial plant machinery," by pixabay.com used under CC BY 2.0. Desaturated with colour filter from original and cropped. Trade relations between the United States and China have grown increasingly tense, spurred by concerns that growing imports from China have led to plant closures and job loss in the United States. We find a link between the sharp decline in U.S. manufacturing employment after 2000 and the granting of Permanent Normal Trade Relations (PNTR) to China, which eliminated uncertainty about China‘s continued access to the U.S. market. Our research into the reactions of U.S. and Chinese firms to PNTR highlights the sensitivity of firm behavior to policy uncertainty. 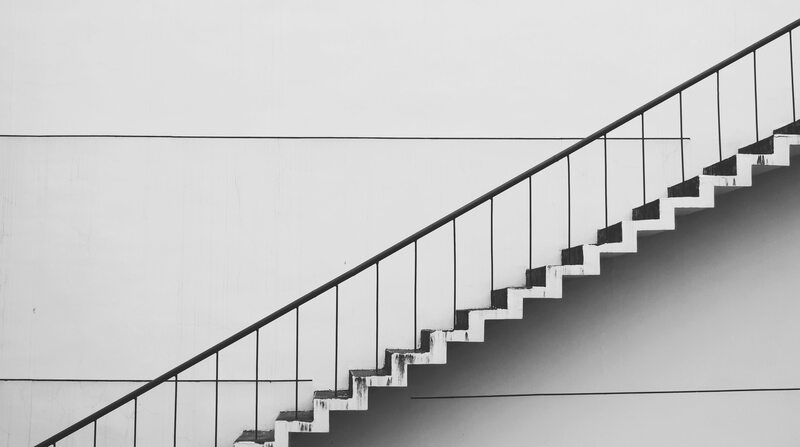 "Contemporary gradient handrails," by pixabay.com used under CC BY 2.0. Desaturated with colour filter from original and cropped. Women are often paid less than men, they are often underrepresented in leading positions, and their careers develop at a slower pace than those of men. Here, we ask to what extent these differences can be explained by childbearing. To evaluate the career cost associated with having children, we consider women’s decisions regarding labor supply, occupation, fertility and savings. We evaluate the life-cycle career cost of children to be equivalent to 35 percent of a woman’s total earnings. We further show that part of this cost arises well before children are born through selection into careers characterized by lower wages but also lower skill depreciation.